The Blue Duck stands at the confluence of three great trout rivers - the Cobungra, Bundarra and Mitta Mitta, hence the name of the location, Anglers Rest. 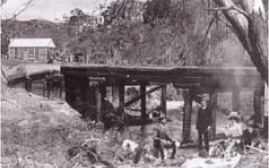 The site of the current historic bridge was originally called Jack's Crossing, named after the overseer of the Mount Wills station who drowned fording the flooded Cobungra River with a team of packhorses in 1856. 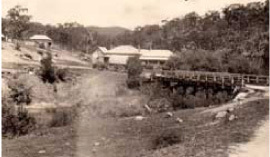 The original 1900 building was a slab construction cut from local timber, which operated as a butcher shop offering fresh meat to miners on the walking track from Omeo to the gold fields around Mt. Wills. 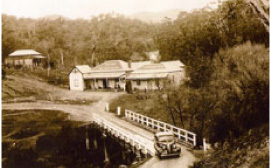 Billy O’Connell, a successful miner, bought the building and obtained a hotel license in 1912, on the promise that the main road would pass the site, a promise that did not eventuate as the first survey submitted was turned down by the Government. So O'Connell nailed a panning dish to the front of the hotel and wrote with irony, 'Blue Duck' on it in large letters - a mining term for a white elephant. If you take out a gold lease and it produces no gold, it's universally known as a ‘blue duck’. In the early 20’s, Billy O’Connell transported two houses from Omeo – room by room - through the bush on horse drays. One is the main building of the Blue Duck, and the other one was used as a residence, on the site where the existing cabins are. Billy O’Connell settled there with his wife Lillian and raised 9 children. Another of Billy O'Connell's legacies at Anglers Rest is the small log structure behind the pub. Known as State School Number 4286, O'Connell built it in 1926 when five of his nine children were of school age. The Education Department provided a teacher to be shared on part-time with Glen Wills. He rode his horse between the two schools, taught at the Anglers Rest School on Monday and Tuesday, and Glen Wills’ the rest of the week. In spite of their initial pessimism, the O'Connells' establishment was discovered by keen anglers from the city. One of their regular visitors was Sir Harold Clapp, head of the Victorian Railways. In the 1930s, Clapp arranged for first-year apprentices at Newport rail yards to cast the beautiful art deco bronze blue duck at the entrance to the property. The O'Connells left in 1946 after which the Blue Duck passed through many hands. The Blue Duck relinquished its license in 1967 when the gold petered out. The Blue Duck regained its license in 1998. Today, comfortable accommodation and hearty meals in the original pub are still found, as well as the same High Country hospitality.